"The REAL Source of Tax Sale Bargains: The At-Risk Property Owner"
Yesterday, we talked about how difficult it is to get a bargain at a tax deed auction because there are always other bidders there, ready to push the price well above what you'd like to pay. And you also saw why it's so difficult to get a bargain property though tax lien investment - there is either a similar bidding process that pushes the price too high, or if you're lucky enough to get a bargain lien, you will probably be paid off. So, how do we take advantage of the tax sale to get super-bargain properties? We Buy Directly From The Delinquent Property Owners! Let's talk about the owners of property nearing a final tax payment deadline. As you'll see, they're an interesting bunch. Most of these owners are not desparately trying to save their "homestead" (although you will encounter that occasionally). Instead, a good number of these owners have walked away from the property or just cannot pay the taxes on the property despite owning it free and clear. This is frequently the result of an inheritance or the death of the original property owner. Somewhere down the line, the property was thrown into the new owner's lap and they were unequipped to deal with it. Maybe they've been sinking money into it to "keep it alive" and have finally decided it's a losing proposition. Maybe they even bought the property themselves and had plans for it at one time, but never were able to follow through with them. For whatever reason, they just want to bury their head in the sand and forget about the property. And they have. Where does it end up? Tax sale. Tomorrow we'll talk more about the 4 types of owners you'll talk to when you contact them about their delinquent property. But for now, let's look at what would happen if we bought a tax lien against a particular property owned by one of these "don't wanters". If we were to purchase a property tax lien against such a property, we would probably end up with the property. The "don't wanter" owner would not pay us off. But let's do the math. Say 500 property tax liens are offered in your county. 250 of them will not be purchased because the underlying property is not even worth the amount of taxes owed. Of the 250 liens that are purchased, maybe 100 of them are bought for much less than the property is worth. Of those 100, 5% do not redeem. So with an offering of 500 liens, there are about 5 bargain purchases to be made through the tax lien process. How are you going to identify those 5 properties in advance so you can make your bargain lien purchase? You can't! You just have to hope you get lucky and buy the right liens. To regularly get bargain properties, you'd need a crystal ball. We're going to let the tax lien investors research the 500 properties and buy dozens of liens. We're going to wait a while and let most of the liens pay off. Then, shortly before the final payment deadline, we're going to see which are left unpaid. In the example I just gave, how many liens will still be unpaid near the deadine? Maybe 50? Will those 5 bargain properties that are going to be lost be in that list? The same effect is seen in tax deed states. The handful of good properties which are going to actually be lost to the tax deed sale, will be on the final tax deed list. All the others will have been paid off by the owner or the bank. Now we contact the owners of those 50 properties, and the "cream rises to the top". The 5 owners who are about to lose their property over a few thousand dollars in taxes will be on our list. We'll contact them, and offer them some money before they lose their property, when they had already resigned themselves to do so anyway. They'll see the value to our offer, and take it. 1. We didn't research 500 properties before the sale. 2. We let the other tax sale investors sort out which properties had value, because they felt it was worth purchasing a lien, or we waited for the tax deed list to come out. 3. We didn't tie up thousands of dollars in liens and legal fees or bid against other bidders at the deed sale. 4. By waiting until near the tax sale deadline, we got our prospect list down to 10% or less of the original tax sale list. 5. Our list contained everyone who is planning to let their property go, or who just can't pay. Now we contact the owners, knowing that the 5 who are about to provide a bargain to the tax lien investor, or lose their property to the deed sale, are on our list. We're about to grab a deed to the property right as the tax lien investor is licking his chops. Or we might see him at the tax deed sale with a $50,000 check in his hands, ready to bid on the property. Too bad for him, we just got a deed to that property from the owner, and quickly resold it or paid the taxes off - it won't be in his portfolio any time soon. If we ever talk to him about our activities, he might get a scowl on his face and call us a "DeedGrabber". That's OK, we can't be everything to everyone! "Who Sells Their Property for $200!?!?!?" This did not display on my blackberry, where i read most of my emails, causing me to unsubscribe. However, since I am able to read your information on my laptop, would you please resubscribe me so I can read about "Who sells their property for $200?"? Thanks. This can only work if the "No Wanter" OWNS the property Free & Clear, right? Because if there is a mortgage on it, the BANK still technically owns it. The "No Wanter" cannot simply sign over the property when in fact, he does not fully OWN it. And from what I understand of 'Quit Claims,' simply because the "No Wanter" signs one over to us, it does NOT make the property ours. He is simply signing away his Rights to make any future claim to the property, and/or any profits derived from it. A bank does not own a property on which it has a mortgage, in ANY sense of the word. Of course it can foreclose and become the owner if the owner stops paying. You are also incorrect when you stated that an owner with a mortgage cannot sign over a property because he doesn't "fully own it". Unless there are multiple owners, the owner of record DOES "fully own it". That full ownership is subject to encumbrances like mortgages, and the powers those have (such as foreclosure). Unless in bankruptcy, ordinarily an owner can transfer his full ownership interest with a QuitClaim deed regardless of encumbrances. The grantee of this deed will then possess whatever ownership interest the owner had. But I'm pretty sure I know where you're coming from. You WILL NOT wipe out any liens or mortgages if you buy a property in the manner I suggest. So it is an important part of the process to get a title report and see what you would have to deal with if you got a deed. The reason my system works so well, is that most properties that reach tax foreclosure are free and clear. Why? The banks have already redeemed most of the properties on which there are mortgages! So those have dropped off the list and the ones remaining have a much greater chance of being free and clear. Mortgaged properties DO slip through the cracks however so don't make any assumptions. how do we check for encumbrances such as mortgages, bankruptcies and other liens ourselves without getting a full title report on every lead? Also what things are wiped out by the tax sale? First step is to ask the owner about those things. They will tell you the truth 90% of the time. So if they tell you something you don't want to hear, you can immediately move on. Next, if they state it's free and clear or if you are OK with whatever encumbrances they disclose to you, negotiate a deal. Next, get on the county recorder's website, if available in your area, and type in the owner's name and see if you can dig anything up. Only now will you order a title report before proceeding. This will keep you from wasting money on full title reports most of the time. The tax sale generally wipes out everything against the property. Of course by then we can't buy from the owner anymore so we have to deal with the encumbrances of record when we buy. Thank you for your very quick response . I have one more question let's say I have a quick claim deed to the property and the property goes to a tax sale auction and a over bid did occur. As the holder of that quick claim deed I am entitled to what ever overage there is from that auction right? And if so am I responsible for any liens or in judgment against this property. Even though it was sold at the tax deed sale? Those are all possible scenarios. Most properties that reach the end of the tax sale process are free and clear because any mortgage holders would have usually redeemed by now. So I like to work those. I've found that when a mortgaged property falls through the cracks and ends up on our list, the mortgage is usually extremely high compared to value. One thing I learned the hard way, is don't do "subject to" deals just because you can - there MUST be equity (preferably LOTS) or you're going to regret it. I am getting ready to purchase your book, but from reading some of these comments and replies I'm so confused. Do you help the customers in getting a deed? and is there a list of homes or basically I'm saying does your customers know where to begin? 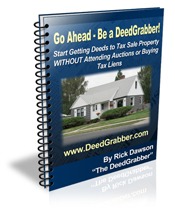 My ebook shows you how to get the deed, from lists to selling the property and everything in between. It explains the entire business from start to finish. If you have any questions after reading it you can create a support ticket and we'll help. I just recently purchased a book on tax liens and the only difference is there is a redemption period before the money is distributed. what makes your book so different? I am just looking for the right program to help me with a supplemental income I have lost alot of money on other wasteful programs so please forgive me if I sound scared and sceptical. Books on tax liens tell you how to buy tax liens as a way to earn interest and acquire property if the liens don't pay off. My system shows you how to go to the OWNERS of a property shortly before a tax lien buyer is about to gain ownership of it, and negotiate a REALLY low price. Totally different. Tax liens rarely result in a property. However they can return nice interest rates if you know what you're doing. Make sure to start slow until you have some experience, and be conscious that you likely will be earning some interest and getting little or no property. My question is basically the same as that of Vincent's question of October 1st. Can you obtain the deed to a tax sale property and just let the property sell at the tax sale showing you as the present owner so you could get any "overbid" funds from the sale? If I'm not mistaken, I read somewhere oline that someone was offering such a course showing you just how to do that. Yes, in some states you can do that. 1. They must have an overage system which entitles the owner to collect any overage after the property is lost. 2. Read carefully the code section that states who gets the overage; sometimes it's the owner as of the tax sale ANNOUNCEMENT not the tax sale itself. Other times you must have certain paperwork filled out when buying the property, such as in Indiana. It's a great strategy, and one that I've made a lot of money from. The main pitfall is that in most states you don't know if the property will generate a surplus until after you've bought it - so your money is always at risk. Finally in some states like Florida the title must be clear or you will not be able to easily claim the surplus. After reading these comments, days before the tax sale we approach the owners.He agrees on a small payoff then we do a quitclaim deed and update/pay property taxes. We will then own property free and clear. We do some due diligence before taking over the property for liens. My question is the mortgage or lender involved anymore? Do we start repaying the mortgage payments/liens again. Is the mortgage/liens wipe out due to tax sale notification.I'm confused. If you buy the property from the owner days before the tax sale, any mortgages or liens ARE NOT wiped out. That's why it's important to check for these before spending any kind of real money on the property. If there are mortgages or liens, but they are low compared to the property's value, you may choose to proceed and pay them off later through an eventual sale. In the meantime you may need to make payments to keep them current. Most properties that reach this point in the tax sale process,. are free and clear. This is because banks usually pay off the taxes to avoid the tax sale wiping them out. Therefore, the properties that are left at the end are usually properties with no mortgage. Most of what you say is correct, but purchasing the property after the tax lien sale, does not wipe anything clear. You must check property title to make sure it's clear. Most properties don't have mortgages at the later stages, because any banks would have paid off the taxes by then. They do frequently have other miscellaneous liens, but this will help in your negotiations with the owner. You can often get a discount for the full value of the lien, and then negotiate a release for the lien for much less. At worst, you can at least wait until you resell, and use your buyer's money to pay off the liens at closing. You say, "We’re going to let the tax lien investors research the 500 properties and buy dozens of liens. We’re going to wait a while and let most of the liens pay off. Then, shortly before the final payment deadline, we’re going to see which are left unpaid." My question to you is , "How can you find out which are left unpaid?" sold at previous tax-lien auction sales? You'll have to do a public records request with the county to find out. 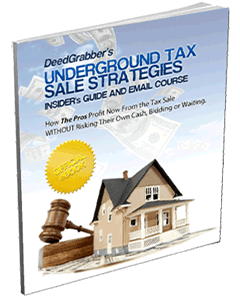 Many keep "tax sale books" where the up-to-date info is recorded about who redeemed and who didn't. Most have been replaced by computers now but be equivalent to what's required by law to be kept as records. The county doesn't publish any such list but must, at a minimum, allow you to inspect the records to see which are still unpaid. Most will do a query for you and send by email if you ask the right person nicely. The fact they don't publish these is what makes it such a nice "secret" list to work! What about purchasing the deed in a redeemable deed state after the sale but before the drop dead date? That's great, it's similar to working a tax lien state. Just make sure that the owner can give you a deed to the property and that they don't have to get title back from the tax sale buyer by redeeming first. There are ways of doing this where the owner could put a deed to you in escrow, you could redeem, and once the tax sale buyer returns title you can record the deed from the original owner. I want to know what is the best county in nebraska to start or is Nebraska even a good state to look at?? What state do you suggest a beginner go to have some success?? Any will work - no "best" county. High populations will give you more to do per county, and I stay away from counties that have extremely low property values. That's about it. Which states have low property value? Is Dallas, Texas a good place to use your strategy? All states have low property value somewhere, this is not necessarily good. I like to look at an area on Realtor.com and see that properties start at no less than $20k and quickly go to the $50k range or more. After $100k you start doing fewer deals but often more profitable. I live in Florida. As lucrative as the possibilities may seem, the opportunities to capitalize on excess proceeds is difficult. Per Florida statute 197.522 (1)(a), all other lien holders are entitled to excess proceeds before the title holder; furthermore, it even goes back to the owner who has their name on the LAST assessment roll! For someone who just wanted to come in and make a deal 2 weeks before the sale and sign a quit claim just to be the owner on record by the day of the sale, it won't work. I'd like to make money on excess proceeds, but more and more states and counties are making laws that force some investors to have a degree of seasoning in order to have a legitimate claim for the excess proceeds. I live in Washington state and have attended the tax sale of Pierce county. I would be interested in attending tax auctions for you. There is King, Thurston, Mason, Lewis, Kitsap and Pierce. Most of these auctions are held in the late fall and early in the following year. Any questions please call xxxxxxxxxx which is my cell phone. My strategy is not to go to tax sales! So that's issue number 1. Don't ask for a tax list, ask for a list of all delinquent properties. Look into your state's recordkeeping system a little bit first, then you'll know the exact item to ask for, it's not a "tax sale list". If the first person you talk to doesn't know what you're referring to, talk to supervisors until you find someone who does.